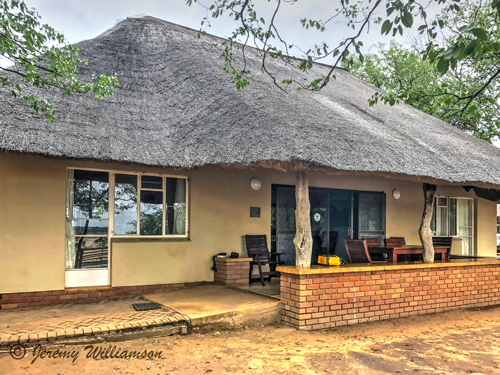 Letaba Restcamp in the Kruger Park is located on a sweeping bend on the Letaba River. 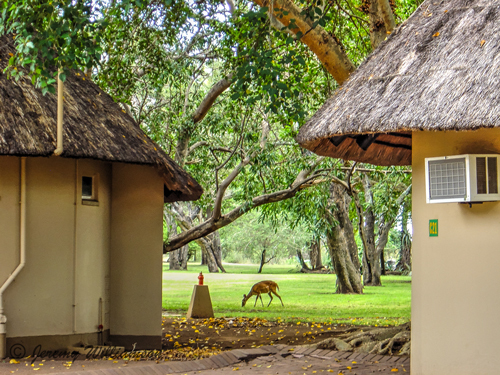 The camp affords a wonderful oasis from the surrounding Mopane bush with lush riverine trees providing welcome shade. Letaba Camp is situated on the southern bank of the Letaba River only 50 km from the Phalaborwa Gate. 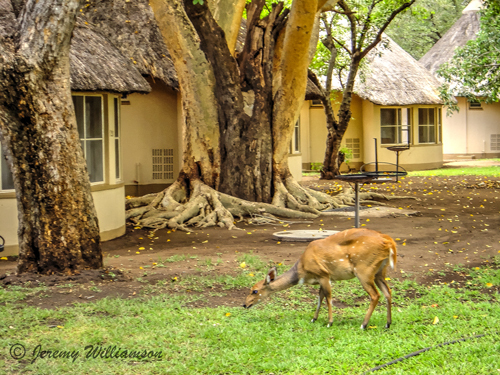 Letaba restcamp and caravan park have beautiful lawns and colossal shade trees. The area is well known for its large apple-leaf, umbrella thorn and mopane trees. Rare animal species, such as eland, Sharpe's grysbok and roan may be seen. Areas worth visiting include the Engelhardt Dam and the Mingerhout Dam. The gravel road to Olifants Restcamp along the Letaba River provides a beautiful scenic drive on which game is frequently sighted. 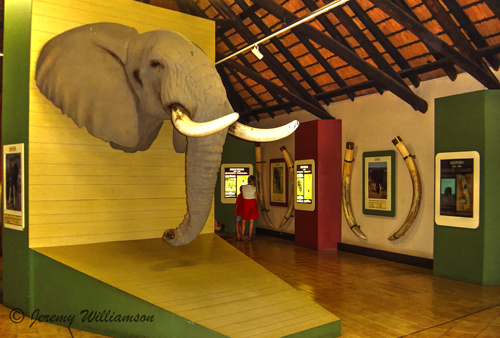 Areas of interest inside the camp are Elephant Hall, a natural history monument, and Riverside Walk, while outside of camp you may visit the Masorini Ruins, Engelhard Dam and view point, Matambeni bird hide, Mooiplaas picnic site and Mingerhout Dam. Accommodation in Guesthouses, Cottages, Bungalows and Tents. Curio shop and grocery store. Letaba Guesthouse - Fish Eagle Guesthouse (On the river front) - accommodation for 8 persons. 4 x air-conditioned bedrooms, each with two single beds and a bathroom en suite (bath, shower, toilet and basin). Lounge/dining room with ceiling fan and guest toilet. Kitchen with an electric stove (with oven), refrigerator, freezer, sink, cooking utensils, crockery and cutlery. Open veranda, barbecue facilities, open parking. Melville Guesthouse (On the river front) - accommodation for 9 persons, 3 x air-conditioned bedrooms, each with two single beds and a bathroom en suite. Two bathrooms each have a bath, toilet and basin. The third bathroom has a shower, toilet and basin. Each bedroom has an interleading enclosed veranda with one single bed. Lounge/diningroom with ceiling fan. Kitchen with a gas stove (with oven), refrigerator/freezer, sink, cooking utensils, crockery and cutlery. Barbecue facilities, open parking. Guest Cottages (10) 6-bed, guest cottages comprising of 2 bedrooms (each with air-conditioning and three single beds) and en-suite bathrooms (each with bath, basin, shower and toilet), a lounge/ diningroom with ceiling fan, open-plan kitchen with gas stove (with oven) refrigerator / freezer, sink, cooking utensils,crockery and cutelry, an open verandah, barbeque facilities and open parking. Bungalows. 3-bed bungalows with air-conditioning, shower, toilet, refrigerator, two-plate stove (without oven) and sink. There are basic cooking utensils, crockery and cutlery. Some with veranda. 2-bed bungalows with facilities for handicapped persons available, equipped with air-conditioning, a bath, toilet, two-plate stove (without oven), refrigerator and sink. There are basic cooking utensils, crockery and cutlery. Safari Tents. 4-bed and 2-bed furnished tents with beds, wardrobe, fan, table and chairs, refrigerator and electric light. Tents are situated on cement floors with shade net covering. Cooking utensils, crockery and cutlery are not provided. 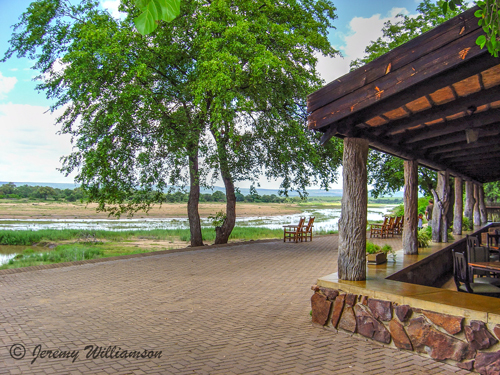 The Nambu (river) Restaurant overlooks the Letaba River. The restaurant can seat up to 80 people and the terrace up to 40. What makes this restaurant unique is the Table D'Hote Menu, you can relax, while the waiters serve you at the table - no queuing for our delicious home-made food. And if you feel like a real South African braai, there is a boma just next to the restaurant which seats up to 50 people. Other facilities include cafetaria, curio shop, laundromat, petrol station, banking facilities, picnic facilities, post box, public telephones and communal kitchens.